Set aside your social fears. Well, this is it! The moment you’ve been anticipating (or dreading) has finally arrived. It’s time to take everything I’ve taught you in the past few articles (here and here) and put it into action. It’s time for you to get out there and begin networking. But first, let me share a few extra tips and encouragement to help you prepare. These tips will put you on the right track to make new connections at your next meeting or event. I know you’ll do great! As I’ve mentioned before, speaking successfully — whether to a single person or to a crowd — requires confidence. Be assured, it is completely normal to feel a little nervous when planning to meet new people. I’m sure we can all relate to at least a few of these common social fears listed by Chris MacLeod at SucceedSocially.com. However, there are ways to overcome your fears. I’ve shared some of my tips in this article and you’ll find even more advice on Chris’ website. One confidence building fact to keep in mind as you prepare to begin connecting is that conferences and networking events aren’t like high school where you have to attend whether you like it or not. Most people at a networking event or conference are there because they want to gain something. Just like you, the other people attending are there to learn, share, and make connections. Everyone is probably feeling the same nervousness that you are, too. People at networking events expect to be approached and most will welcome you. Take the empty seat. When you make the first move by introducing yourself to someone at an event, you are doing them a favor. Practice isn’t just for elevator pitches. Even the best plans can fail in execution. That’s why practice is important. Before your next networking opportunity, prepare a few opening lines and answers to common questions. Then practice saying those phrases out loud. The more familiar you are with your story, the better you will be able to relate it. And the more often you say the words out loud, the less likely you are to stumble over them when in a group. Don’t just recited canned lines, though. When deciding what you’ll say, choose statements that reflect your genuine interests and personality. Happiness is contagious. When you are enjoying yourself and being real, people notice. Smile and be genuine. Your goal is to be able to convey your authentic personality well. If you’ve ever attended a networking event, I’m sure you have encountered plenty of big talkers. Don’t be one of them. You can’t really form a deep connection with someone if you don’t know anything about them. Harvard Business Review told us way back in 1957, listening matters. Successful people don’t talk their way into their success, they listen. When you are in a group of people, the listener is the one who is learning. Listeners are discovering shared interests, business opportunities, and pain points. The person who listens is the person who can help solve your problems because he or she knows what those problems are. Listening also helps you connect your connections. Even if you can’t solve someone’s problem, you may have just met someone who can. Pay attention. Demonstrate your interest in the people you are meeting by actively listening and responding to what they have to say. Learning to make and maintain relationships will enrich both your business and personal life. The tips above are just a taste of what you can learn when you decide to master the art of communication. There is always something new that each of us can learn. From making the most of your time at your next conference to handling an important one-on-one client meeting, improving your communications skills can improve your performance. Plus, once you get the hang of it, meeting new people is fun. If you are headed to a conference soon, check out Content Marketing Institute’s article, How to Network at a Conference Like a Jedi: 55 Tips. It’s jam packed with good advice. If you have any questions, don’t hesitate to ask! 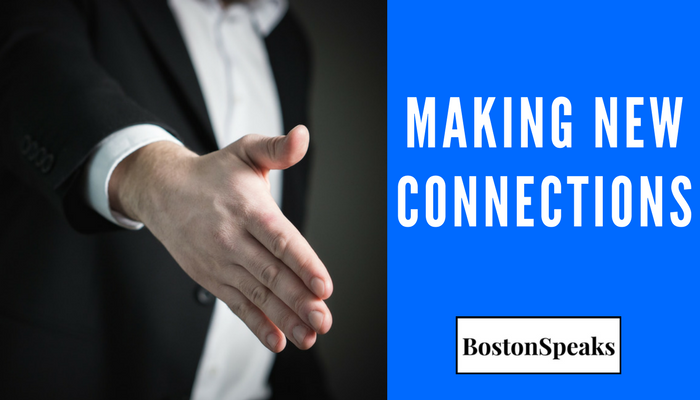 Learn even more about networking, storytelling, public speaking and communication at the BostonSpeaks Blog or watch one of our weekly BostonSpeaksTalks.